Security, multiple payment options, and customer retention are just a few of the many payment processing issues retail merchants must consider to stay competitive and for long term success. Our extensive experience allows us the insight to to keep your fees low, while meeting all of the expectations specific to retail merchants. 1st Advantage Merchant Service New Jersey will provide you with access to the lowest rates and the best customer support with your retail merchant account. 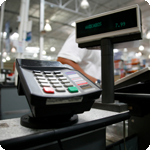 Our experience with retailers, large and small, national and local has allowed us to scale payment processing to the needs of our retailers without sacrificing security or processing speed. No matter the size of your business, we can offer you the same high quality of services, products, and customer support that is usually reserved for larger, national retailers. In today’s competitive retail market, it is almost a requirement that retailers offer customer incentive programs. Options such as gift cards and loyalty programs are becoming the cornerstone of direct consumer marketing, while providing value to the customer themselves and establishing strong customer relationships. VeriFone Credit Card Terminals FREE Placement "No Leasing"
Applepay and NFC Mobile Payment Devices FREE SWIPER!